Reduction 6 –“Kanreki” Special, Dec. 8, 7:30 p.m. Taiko Legacy 15 Dec. 9, 2 p.m.
Special Workshop “Chindonya” (Street Troubadour) Dec. 9, 5:30 p.m. The iconic and expressive thunder of the taiko drums celebrate the 15th Anniversary of the Taiko Legacy with a bang in two programs directed by multi-instrumentalist and media artist Tatsu Aoki, Saturday, Dec. 8 at 7:30 p.m. and Sunday, Dec. 9 at 2 p.m. at the Museum of Contemporary Art Chicago, 220 E. Chicago Ave. The 15th Anniversary celebration also includes a special “Chindonya” (Street Troubadour) workshop Sunday, Dec. 9, 5:30 p.m.
Tsukasa Taiko is a program of Asian Improv aRts Midwest and the Japanese American Service Committee of Chicago and is supported in part by the Illinois Arts Council, the MacArthur Fund for Arts & Culture at The Richard H. Driehaus Foundation, the Alphawood Foundation, CDH. P.C, JCCC Foundation, Gaylord & Dorothy Donnelley Foundation, The Field Foundation of Illinois. Reduction 6 – “Kanreki” Special; Saturday, Dec. 8, 7:30 p.m. The Reduction concerts are a rich, erudite counterpoint to mainstream taiko drumming usually seen on contemporary stages. 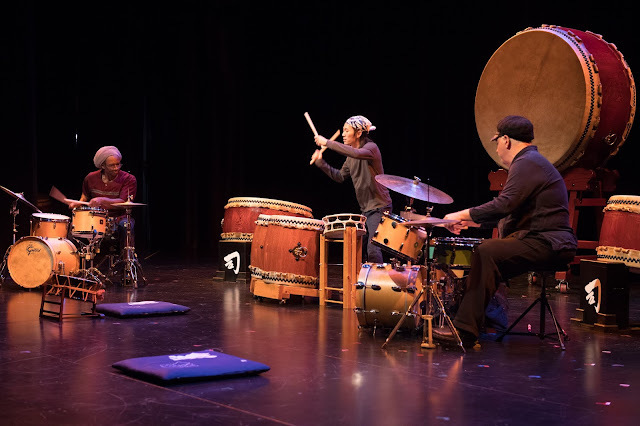 They find roots in the authentic origins of taiko, but continues to expand and deepen the artistic palette drawing on the rich traditions of classic and contemporary jazz. This year’s presentation features special segments from director Tatsu Aoki’s renowned Basser Live concerts commemorating his achieving kanreki, or his 60th birthday. In Japan, this significant birthday celebrates the completion of one Zodiac cycle and is a kind of a “second birth” and time to reflect on the past, as well as look ahead towards the future. Joining the drummers in this memorable kanreki ritual will be Chicago’s jazz artists Hamid Drake (drummer and percussionist), Michael Zerang (percussionist) and Nicole Mitchell (flutist/ composer) plus Chizuru Kineya (shamisen) and chindonya performer Yasushi Shimazaki. 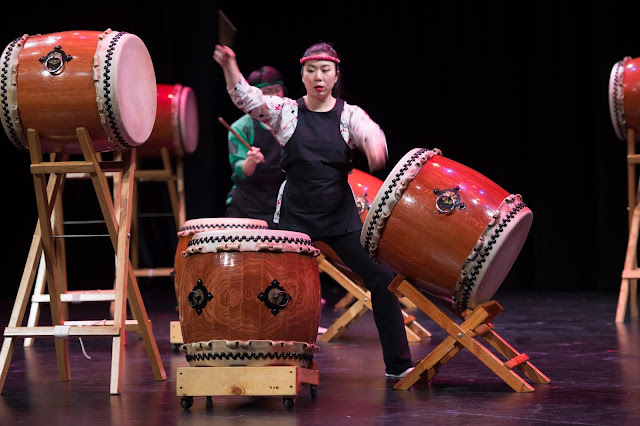 Taiko Legacy 15, with Tsukasa Taiko; Sunday, Dec. 9, 2 p.m.
Taiko Legacy is a popular perennial celebration of Japanese cultural heritage featuring leading contemporary performers. Taiko literally means “drum,” and Taiko Legacy is known for its thunderous sound and stunning, stylized choreography. Joining the Tsukasa Taiko ensemble will be featured guests Melody Takata and the GenRyu Arts of San Francisco, classical music grandmasters from Japan, Chizuru Kineya and chindonya (traditional troubadour) artist Yasushi Shimazaki, leader of the 5:30 p.m. workshop (see below). Special Workshop: Chindonya (Street Troubadour); Sunday, Dec. 9, 5:30 p.m.
Taiko Legacy guest artist, Yasushi Shimazaki will present a special hands-on workshop tracing the origins of chindonya culture and explaining various instruments and routines, as well the theatrical implications of being a chindonya in today’s time. Chindonya is a type of Japanese street musician hired to advertise for local shops and businesses. Believed to be part of Japanese culture for more than 150 years, these elaborately dressed performers parade through the streets playing music and singing to gather attention for their clients. Chindonya was especially popular around WWII and today the tradition is experiencing something of a resurgence in Japan. Chicago’s Tatsu Aoki is a prolific composer and performer of traditional and experimental music forms, a filmmaker, and an educator. He was born in Tokyo in 1957 into the Toyoakimoto artisan family, a traditional house for training and booking agents for geisha. Aoki was part of his family’s performance crew from the age of four. In the late 1960s, he shifted his energies from the traditional to American pop and experimental music. By the early 1970s, Aoki was active in Tokyo’s underground arts movement as a member of Gintenkai, an experimental ensemble that combined traditional music and new Western forms. Aoki left Tokyo in 1977 and is now one of the most in-demand performers of bass, shamisen, and taiko, with more than 90 recording projects and 35 years of international touring to his credit. Aoki is Founder and Artistic Director of Chicago Asian American Jazz Festival, which celebrated its 20th year in 2015. As Executive Director of Asian Improv aRts MidWest (AIRMW), an Asian American cultural arts presenter organization, he has initiated and managed several programs to advance the understanding of traditional arts and community through the arts, including the annual Chicago Asian American Jazz Festival, the Tsukasa Taiko Legacy, and the Toyoaki Shamisen arts residency projects. Aoki was selected by the Asian American Advisory Council of Illinois in 2017 for the Community Service Award from the Illinois Secretary of State, Jesse White. He also received the prestigious Commendation for the Promotion of Japanese Culture from the Foreign Ministry in Japan, which is given to individuals with outstanding achievements in international fields and acknowledges the recipient’s contributions to the promotion of friendship between Japan and other countries. This past May, Aoki was honored as the first recipient of the “George Award”, for his years of support, recording, and performance with renowned American Jazz and soul guitarist George Freeman. The multigenerational ensemble Tsukasa Taiko, is a program of Asian Improv aRts Midwest and a resident at Japanese American Service Committee of Chicago (JASC). It anchors the traditional musical relationship between shamisen, dance, and taiko. This ensemble performance explores often-overlooked melodic capacity of the taiko using original compositions and arrangements rooted in a broad range of musical styles including ozashiki (geisha chamber music), minyo (folk music), ohayashi (classical/folk/theater music), and matsuri taiko (festival taiko music). Tsukasa Taiko is unique in that it presents not only the kumi-daiko style, but other forms of music that include other instruments, such as the shamisen (three-stringed lute) and the shinobue (transverse bamboo flute). The shamisen has a rich tradition in the folk and classical music of Japan as does the shinobue, which holds a prominent role in kabuki theater music as well as matsuri festival music. Tsukasa Taiko performs music that includes zashiki (chamber music), minyo (folk music) and ohayashi (classical/folk/ theater music) styles, representing many Japanese musical traditions that are now rarely heard. Tsukasa Taiko is proud to have a role in the preservation, development and presentation of these cultural art forms. In 1984, Chicago artist and community leader Tatsu Aoki founded Innocent Eyes and Lenses (IEL) in response to the need for an organization that was dedicated to presenting Asian American artists and programs that were relevant to the community. He sought to make IEL, an Illinois-based non-profit organization, a leading force in presenting the Asian American experience through the arts in Illinois. In 2004, IEL changed its name to Asian Improv aRts Midwest. This change was made to to reflect the community that IEL has been serving since its inception as well as to recognize the partnership that has been established with the San Francisco-based Asian Improv aRts. Founded by musician and community activist Francis Wong, Asian Improv aRts has been a leader in building community through the Asian American cultural arts on the West Coast for two decades and AIRMW is honored to be a part of the Asian Improv family. AIRMW has had tremendous success in connecting artists, community organizations and the city's cultural institutions and has presented programs featuring world-class artistry while remaining rooted in the Chicago Asian American community. AIRMW has collaborated with and/or received support from organizations that include the Japanese American Service Committee (JASC), the Jazz Institute of Chicago, the Museum of Contemporary Art, the Chicago Cultural Center, the Illinois Arts Council, the Illinois Humanities Council, the Richard H. Driehaus Foundation, the National Endowment for the Arts, the Boeing Corporation, the Japanese Chamber of Commerce and Industry of Chicago Foundation and Meet The Composer among many others. For more information about AIRMW, visit asianimprovartsmw.org.